Coincidences or God at work? WHEN I was about twelve years old, living in South London, I loved riding around on the bicycle my parents bought as a reward for passing my 11‑plus exams. It was relatively safe to do that in those days. I wanted to go somewhere different and chose to follow the No 49 bus route from St Leonard’s Church in Streatham to Shepherd’s Bush. After I had been riding for some time I realised that I had only just enough time to get back home in time for tea. I was a good boy and so I set off back immediately despite the fact that I had not reached my goal. I had not realised that I had passed through a one way system – mainly because on the way out it did not involve any ‘one way’ or diversion signs. I suddenly found myself at a set of traffic lights I did not recognise. This bothered me a lot because, even then, I had a very strong memory of places I had been to before. I was lost. I was very scared and I was very sorry that I would not be home in time for tea. The lights seemed to take a long time to change, giving me plenty of time to look around to see if I recognised anything. There straight in front of me, on the opposite corner, was a sign reading ‘Follow the No 49 Bus Route’ with a very helpful arrow pointing me in the right direction to rejoin the ‘two way’ part of my route which I readily recognised. A massive coincidence – especially as I had never before, and never since, seen a sign like it. At least that was what I thought at the time. Some twenty plus years later, Shirley and I started searching for something, which we found here in Prestbury – our faith. Up until that time the thought of going to church never entered our heads apart from baptisms, weddings and funerals, of course. Over the years a number of remarkable coincidences had led us to being here, which at the time was, and still is, so right for us. The incident on my bicycle ride kept haunting me until I came to the stark realisation that it was not a coincidence at all. It was the hand of God. I tried to put that thought out of my head until I read a quote from Archbishop Temple to the effect that the more his faith grew the more coincidences happened to him. God is with us through the good times and the bad. Everyone has remarkable things happen to them. Sometimes they get us out of difficult situations. Sometimes they bring on the kind of feeling of deep warmth that cannot be explained. Are they just coincidences? Well, maybe some of them are, but we should not rule out the fact that our loving God is watching over us at all times and this may just be one of his helpful interventions. So a quick ‘thank you, God’, will never go amiss. Harvest at St Mary’s was new this year. For the first time in several years we celebrated a Eucharist with a Difference, making the service that so many of us know and love just that little bit more accessible to those who are new to Church, those who may be returning after a few years, occasional worshippers and children. This last group hold a special place of honour within Christian belief. Indeed for those who have the ears to hear, it is often through the mouths of infants and children that God speaks most clearly. The keynotes here are inviting and involving. By making small changes to our regular service we are practising a very special kind of hospitality. One thing that was particularly helpful for this first service was the feedback – both positive and negative – that people shared with the leaders and wardens afterwards. These thoughts will help us as we plan future services. You may have realised that there was some indecision about the name, but after consultation we have decided Eucharist with a Difference sums it up best (and my apologies to anyone who was confused by the working name I gave it in the September issue). What we do want to emphasise, however, is that this is a new start, not a return to anything we did in the past, and that in each Church the worship is shaped by the local community: we certainly don’t believe that ‘one shape fits all’. So if you would like to be involved in helping to make the service happen, or have ideas about how we can make it work for the groups mentioned above, please get in touch. The next Eucharist with a Difference is due to take place on Sunday 22nd November, the feast of Christ the King. Please start thinking now about whom you can invite, and encourage everyone, adults and children, to invite their friends. Thank you to everyone who helped with the Harvest posies, particularly Thora Anstee for organising this for us. The posies looked beautiful around the font in St Mary’s, each one very individual and making a splash of colour for us to enjoy when entering the church at the Harvest Festival services. The posies were delivered either Sunday or Monday to the housebound and sick within the parish. Thank you so much for everyone’s willingness to deliver them all and give joy to the recipients. Saturday 3rd October, weather beginning to turn autumnal. Karen kindly called for me just after 9 o’clock, Janet and Deacon Jennifer already aboard, and together we made our way to the Marist Centre at Nympsfield, where we received a warm welcome from the nuns, tea and coffee at the ready. Together with Father John Mead and other members from St Mary’s and St Nicolas’, we made a party of ten. Quiet days are always a joy, times when the cares of the world can slide from our shoulders, a time to bring us into closer communion with God, time for reflection. Today’s focus was slightly different from usual. Father John asked us to consider the works of two highly controversial artists: Caravaggio and Stanley Spencer. He warned us that we might not like all of their work, we might be shocked, might even be offended, but that we should keep an open mind. Both, he told us, were men who lived less than perfect lives; indeed, Caravaggio was a murderer, but both men, with their highly original perspectives on Christ, had great insights to offer. Pre-lunch we looked at Caravaggio’s work: chiaroscuro, light emerging from darkness, guiding our eyes. Models were drawn from the streets, faces worn and lined, feet grimed with filth. We compared two versions of the Supper at Emmaus and identified with the moment of revelation as weary travellers recognised the risen Christ. The Virgin of Loreto with its very real Spanish woman carrying a very real baby, two peasants kneeling at her feet. We should never forget that God works with real people, not the ideal and impossibly beautiful. At noon we paused for prayer in the chapel, each contributing. Lunch proved a veritable feast as each of our contributions was added. The focus turned to Stanley Spencer, born and living for most of his life in the village of Cookham. Spencer too felt that the sacred was to be found in the fabric of every day; so much so that his great painting, Resurrection at Cookham shows local people, easily recognisable and including himself and his wife, rising from their graves in the local churchyard on Judgment Day. His figures are humorous, almost cartoon-like, but in their domestic joy they are profoundly moving. Spencer was an official Second World War artist and has painted huge murals in the chapel at Sandham. There are no gory depictions of wounds, but soldiers carrying out every-day tasks of cleaning kit, peeling potatoes, rolling bandages, making beds, drinking tea and, most of all, offering up their own multitude of white crosses to the risen Christ in Heaven. He even included the pack-carrying mules. Father John concluded by leading us to see how Christ’s life and suffering touches our own lives, transforming the secular and sometimes squalid into something sacred and spiritual. We certainly received something to reflect upon and carry into the future. The day ended with hymns, prayer and a simple Mass before we went on our way, refreshed and thoughtful. Many thanks to Father John, the nuns at Nympsfield and all who contributed to that special day. A brief update this time, but I am hopeful that one or two of the people currently experiencing the Alpha course will put pen to paper themselves. Since the last edition went to print there were several more responses to the launch supper and now we have fifteen people doing the course, including leaders. These have divided into two groups, meeting on Mondays and Wednesdays, and the early feedback I have received is very positive. Many thanks to all those who are praying, to the Wyatts and the Lyles for hosting, to the Joneses, Vanessa, Sarah and Liz for leading, and everyone – too many to name – who has provided and is providing food. Organising Alpha is a lot of hard work, but definitely worthwhile, and we are learning important lessons as we go along. The next step will be to hear from those doing the course what they would like to do next. If you have any thoughts about this, or about outreach in general, do please get in touch. This event has the aim of raising money to pay directly for repairs and maintenance to the fabric of the county’s ancient churches and was held on a day when fortunately the weather was kind for outdoor activity. The amount of support riders received was very generous and it is a shame that more support is not forthcoming from the wider community. We are all attempting to assist and support in maintaining our heritage in the county, which I believe is much valued. At St Nicolas’ Brian Wood and I were successful in collecting £180.00, while Matt Bestwick at St Mary’s collected £88.50. Half of the money goes to GHCT and half to our own churches. The organisers and participants wish to say a big ‘Thankyou’ to all those who sponsored and supported their efforts on 12th September this year. The event next year will take place on Saturday 11th September 2010… see you there! I HAVE been getting more organised of late. It is fairly normal to write things in your diary in advance, like ‘MOT’ and ‘Wedding Anniversary’, but recently I have found the need to anticipate more so that I do not have to rely on other people contacting me. A good example is the Vocations Conference held every year, or so I thought, at Trinity College in Bristol. Last year the publicity did not appear in time for our magazine deadline, which meant no one here knew about it. So I made a note in my diary this year to get the information well in advance. Imagine my disappointment, therefore, to find that last year’s conference had to be cancelled due to ‘lack of interest’, and my concern to hear that it has been the same story three years in a row. Now this may be because the timing is not quite right (an experience we had ourselves with the Alpha Course back in May), but I wonder if there isn’t also a quiet crisis of vocation within the Church. Do all Christians know that they are called? Do you? The September and October editions of this magazine carried advertisements for another vocations conference, this time run by the Diocese of Gloucester’s Department of Ministry. Did you go? If the answer is ‘no’, it might be interesting to reflect for a moment about why that is. Please do not think that I am trying to induce feelings of guilt or get anyone to do more. That is not what ‘vocation’ is about. In fact my experience has been that those who take their vocation seriously often have to reduce the number of activities they are involved with in order to take things forward (now THAT should get a few peoples’ attention!). The whole emphasis in vocation is working out how, in your life, the calling to follow Jesus works out in practice. It is something that all Christians should be reflecting upon, whether you are at a very early, exploratory stage of faith or have been a believer for some time. We should all be going to one of these every few years, even if it is simply to confirm that we are still on the right track. If you did go to the Diocesan Vocations Day on 10th October, or have had a nagging sense of God guiding you in a particular way, please contact one of the clergy, readers or young people’s workers. We are all people who have experienced this ourselves and it is always exciting to hear about how God is moving others. We may even encourage you to write something for the magazine, as the best stories are the incomplete ones, the ones where there is still some way to go. This ‘incompleteness’ is not a failing. It is a sign that we are growing, travelling on as pilgrims in Christ’s way. WE ARRIVED early at Sidmouth on the Friday morning as we had travelled by car. We found Sidholme Hotel and both of us admired its lovely setting. Later in the day the coach arrived bringing most of the parishioners. Once everyone had checked in it wasn’t long before we were all enjoying a delicious evening meal. This was followed by an ‘ice-breaker’ session in the Music Room – a good way of getting to know everyone. Father David then led Sung Compline at the end of the evening. We were given a programme of activities and services for the weekend, but we were free to do as we pleased. Saturday was warm and sunny. After Morning Prayer and breakfast Sister Elizabeth (a former schoolfriend of Marion), who was of the Carmelite Order from the Friars at Aylesford, led two sessions on the theme God of Compassion. These were well attended. Sister Elizabeth based her talk on the life of St Thérèse of Lisieux, who became a nun at the age of fifteen and died when she was only twenty-four. This was followed by a Said Eucharist led by Father Daniel. Lunch was then served and the afternoon was free. 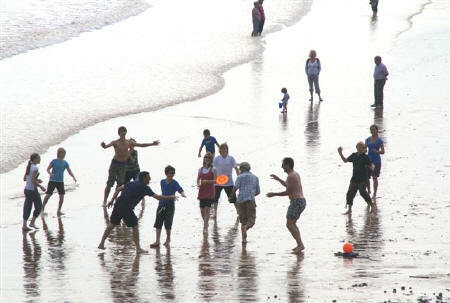 Many of us walked to the seafront, some even braved the water! ...some even braved the water! Throughout the weekend Andy and Sharon Macauly arranged activities for the young people, Linda Biggs catered for the younger ones and Dee Graham ran craft sessions for all ages. There were also sports activities for anyone within the grounds of the hotel. After our evening meal we were invited to go to the Music Room for the ‘Entertainment’. A varied programme followed of performers of all ages, including young magicians, musicians and some of us who made fools of ourselves! This finished with a selection of old time music hall songs which was enjoyed by everyone. On Sunday we attended the Sung Eucharist with Father David presiding. The music was provided by members of the congregation. Sister Elizabeth gave the address with the theme ‘God wants you as you are’. After the service thanks were given to everyone who had helped to make the weekend so enjoyable. We then had our last meal together with time to reflect on the friendship and fellowship we had enjoyed. We would like to thank Marion, all the clergy, the organisers of the activities and the staff of Sidholme Hotel for a super weekend. This was our first ‘Parish Weekend’ and we hope that it won’t be our last. SIDMOUTH was great! On the journey there I didn’t know what to expect, but once we arrived I loved it. Our room was comfortable even though it didn’t have an en-suite bathroom. Marion had kindly arranged for some sandwiches to be left for us because we were too late for supper. After eating, we went to Compline, a service that monks use to close their day. Father Daniel told me that they would traditionally go to bed afterwards without speaking to each other. Before the service Father David taught us how to sing some psalms. The next morning, after a delicious breakfast, Dad and I went swimming. It wasn’t big, but the hotel’s pool wasn’t small either. 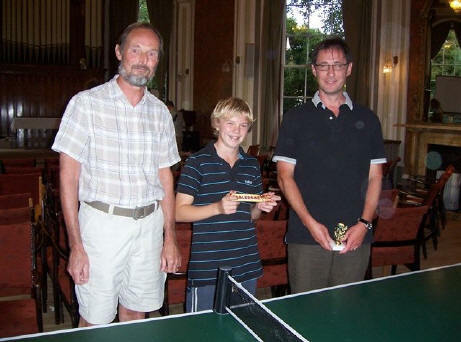 In the early evening there was a ping-pong tournament! It was very hard but eventually Tim Rudge won and Sam was the runner-up. After that we had yet another lovely meal. Next there was a fantastic show in the evening which a lot of people had put a great deal of effort into making. The next day it was time to depart, after a wonderful service. We all had to say goodbye to this hotel for two more years. We had a lovely time with our friends. 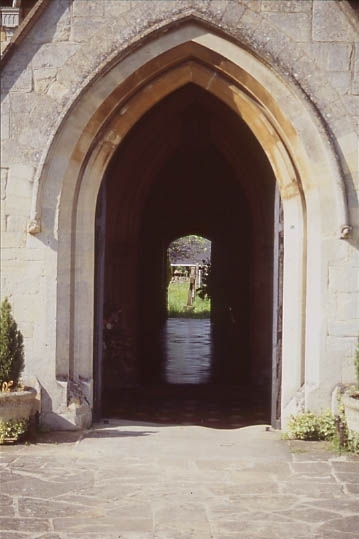 On behalf of St Mary Magdalene, Elmstone Hardwicke, church group, may we thank most sincerely all those concerned for a happy and memorable weekend at ‘Sidholme’. It was enhanced by good weather, good food and wonderful people we were fortunate to meet. Thank you to all who joined us at the Sidmouth weekend. I have had some really nice letters saying how much it was enjoyed. Although it may seem like light years away, I have rebooked for another weekend from Friday 23rd to Sunday 25th September 2011, yes 2011. If you are interested please let me know but there is no need for an immediate rush! Did you come back to Church on 27th September? This was a special day set aside for local Churches to invite back two distinct groups of people: those who used to come to services but, for various reasons, have not been for a while; and those who would come if only someone would ask. Surveys show that nationally this may be as many as double the number of people who presently go to Church! Debbie Hall went back to St George’s, Glasscote, Tamworth on Back to Church Sunday 2007. Juggling life with young children had got in the way of regular church attendance, but she remembers her return fondly: ‘I’d never turned my back on God, but other commitments were on the forefront on my mind. It was just a normal service, but everyone was so nice and they made me feel really special. I was really pleased to be back.’ Debbie is now a regular member of the congregation and serves as ‘welcomer’ for newcomers… and returners! A QUOTE from David Cameron at this year’s Conservative Party Conference in Manchester, but perhaps equally applicable to the cycle ride from John O’ Groats to Land’s End which I have just completed. Just getting to the start was an undertaking in itself, a train journey of around fifteen hours to Thurso on the north coast of Scotland, with changes at Edinburgh and Inverness. Further away from the more populated areas, place names started to appear in both Gaelic and English (eg Kingussie = Ceann à Ghiùthsaich), and many of the small stations were ‘request stops’ only. From Thurso YHA (over a fish & chip shop! ), my first day was a ‘warm-up’ ride of forty miles out to John O’Groats and back, with a detour to Dunnet Head – actually the furthest north point on the mainland. Having sailed out to the start, I returned into the teeth of gale force winds, which I later learned had resulted in the ferries to the Orkneys being cancelled due to the rough seas!! Getting the cycle speedo up to 10mph was a cause for celebration, and the ferocious winds were to be a constant feature of my journey during the coming days. My route from Thurso took me along the north coast, passing the Dounreay nuclear power station, as far as Bettyhill, with regular precipitous descents into picturesque bays and associated small communities, followed inevitably by equally precipitous ascents the other side. From Bettyhill, I turned south along a very sparsely populated so-called ‘A’ road – which in places was single lane with passing places – eventually reaching Inverness two days later, where preparing a self-catering meal bought from the local supermarket provided the evening’s entertainment at the YHA. The following day was a long ride beside Loch Ness and the Caledonian Canal to Fort William; an interesting feature at Fort Augustus, roughly half-way, was the swing bridge (which halted the traffic as a tall-masted yacht passed through) and flight of locks from Loch Ness into the Canal. I unfortunately managed to drop and break my camera on the way into Fort William and realised that I had no idea what day of the week it was and whether there would be a camera shop open – or even one at all! – to buy a new one. On consulting my route plan and timetable I found that it was Saturday, and there was a camera shop, so all was well – although Ben Nevis was shrouded in mist, so no photograph to be had. The next phase of the journey was over to the north end of Loch Lomond, with its marinas and various watersports facilities, which I then followed all the way to the western limits of Glasgow before crossing the Erskine Bridge to skirt the city to the south via the rather unlovely granite suburbs of Paisley and East Kilbride. Sunday lunch was taken sitting on a sandbox outside a petrol station shop and consisted of their last chicken and bacon sandwich, a bag of crisps (cheese and onion, in case you were wondering), a Kit Kat and a bottle of IrnBru – that quintessentially Scots drink (apart from whisky, that is) ‘Bru’d in Scotland from girders’ according to the advertising slogan. At the end of another 70-mile day, I eventually reached my very hospitable B&B in Westoun, near Coalburn (an aptly named former mining community!) where my hosts very kindly went out and bought me an Indian takeaway while I had a bath and made myself presentable. Onion Bhajis the size of which you have never encountered here in the south! The following two days to Carlisle and then to Lancaster, although long (more 70-milers), were not so windy so good progress was made but – as on the entire ride – I had to keep a sharp lookout for glass, potholes and other debris in the cycle lanes. On the first day I passed through Lockerbie, where I visited the Garden of Remembrance for the victims of the 1988 air crash, and also came across the renowned Marriage Room at Gretna Green on the England-Scotland border where young English couples would elope to be married because of the different age requirements in Scotland. Having struggled over Shap Fell, I made a diversion at Kendal to Windermere and Bowness on Lake Windermere, and regretted the commercialisation which has taken over, although the lake itself of course remains very picturesque. After Lancaster, it was impossible to avoid the Manchester-Liverpool sprawl but at least I didn’t get lost and I did manage to locate and visit Wigan Pier, immortalised in the George Orwell novel The Road to Wigan Pier (it is not actually a pier, as in seaside piers, but a canal wharf – currently undergoing refurbishment). The whole area was rife with the names of famous Rugby League teams. My next overnight stop, Ironbridge in Shropshire, has been designated a World Heritage Site and is a fascinating historical ‘museum’ of various industrial processes which had their beginnings there: the production of iron (and the iron bridge itself across the River Severn gorge), clay pipe-making, Coalport China and Jackfield ceramic tiles being the principal ones; the Aga/Raeburn factory is also located there. I could have spent longer there but the schedule was pressing, although I did find time to visit the Severn Valley Steam Railway in Bridgnorth. At Cheltenham, after a welcome pitstop at home, I was joined by members and supporters of Prestbury and Pittville Youth – my chosen charity – and enjoyed their company for a 23-mile stretch as far as Frampton, before continuing on to Bristol. The author of the book of Esther is unknown but it is thought it was written by a Jew due to his nationalism and accurate knowledge of Persian ways. Some have regarded it as fiction and others as a historical novel. Others again think that the knowledge we have of Persian affairs in the fifth century BC gives good grounds for treating Esther as history. It also explains the origin of the Jewish Feast of Purim, celebrating the deliverance of the Jews. It is interesting to note that the name of God is not mentioned but a sense of His care and justice prevails. It is the story of an ordinary woman who was used in an extraordinary way. The Jews are in exile under the rule of Persia. Esther, whose parents had died, had been brought up by her cousin Mordecai, who encouraged her to change her name and conceal her Jewish identity. We are told she was very beautiful and was chosen by the King to become Queen. Herodotus records that the King, Ahasuerus, was a cruel, capricious and sensual man. A plan is executed by Haman, the Prime Minister, to destroy the Jews. Mordecai approaches Esther and asks her to plead to the King for the Jews to be saved. Esther hesitates, knowing that to approach the King without being summoned would be to risk death. Mordecai challenges her: ‘And who knows but that you have come to royal position for such a time as this?’ Esther asks the Jews to join her in a three-day fast. She has everything to lose but chooses to step out of her comfort zone. She takes the risk of approaching the King and a plan is devised to save the Jews. Esther would have been brought up as a Jew and would have been used to keeping the Jewish traditions and customs. Maybe she had a strong faith in God. Could it have been God who challenged her to face up to her past, so being true to herself? Maybe in doing this, she gained the freedom she needed to approach the King and change not only her own situation but also that of the Jews. She had also been well prepared for her role in the year of training she had been given before becoming Queen. This would have been a purifying process with possibly the emphasis on physical beauty but maybe in time she also developed an inner beauty that shone through. Could it have been the strength and wisdom displayed in this inner beauty that appealed to the King? Like Esther, God might want to use our life experience, skills, personality and our uniqueness in the situations we find ourselves in. Do we trust God enough to allow Him to use us to our fullest capacity? ‘At such a time as this’, could God be calling us to do something new in our community and church, bringing about change both in our own lives and in the lives of others? Maybe God is calling you? This is a major festival in our church year and there will be services at all the normal times in our churches. All Saints’ will be keeping this day as their Patronal Festival and all are very welcome to join them at 10.30am or 6.30pm. 9.30am: Said Eucharist in St Mary’s. The names of the departed written on the list in St Mary’s will be read out during this service. 4.30pm: Said Service of the Word in St Nicolas’. This will be a half hour, non-eucharistic service during which the names of the departed written on the list in St Nicolas’ will be read out. 7.30pm: Sung Requiem in All Saints’. The music will be taken from Fauré’s Requiem and during the service a full list of the departed will be read, taken from the names written on the lists in all three churches. There will be an Act of Remembrance during the Sung Eucharist at 9.30am in St Nicolas’. There will also be an Act of Remembrance at 10.45am at Prestbury War Memorial which will be followed by the Sung Eucharist in St Mary’s. At 3.30pm in St Mary’s we will be holding our annual Memorial Service for those who have been bereaved during the past year. This is a service of readings, prayers and music, during which all those attending are invited to light a candle as they remember a loved one. All those who have died during the past year will be commemorated by name during the service. All are welcome to attend, even if you have not received an invitation. There will not be a service at 6.30pm in St Mary’s. On Saturday 7th November, you are invited to the Cheltenham Christian Aid Autumn Fair at St Andrew’s URC Church, Montpellier, from 10.00am to 1.30pm. Stalls, delicious ploughman’s lunches, desserts. Start your Christmas shopping here and benefit those struggling in the poorest areas of the world. Our final bakestall for the year falls on Sunday 15th November. This is the turn of the G-M team, and the proceeds will be shared between the Alice Glenister Foundation and the Cambodia Trust. More information about both these charities can be seen on the church notice board. Modern Jive Night, a Fusion of Modern Jive/Salsa, at the Prestbury Hall, Bouncer’s Lane, under the watchful eyes of our Teacher and Demonstrator, Music from DJ John Baker. Friday 20th November 8.00 - 11.30pm. Bar open from 7.30 pm. £8.00 per ticket with complimentary drink. £10.00 on door. To order tickets ring Shirley Brown on 01242 529774 or Linda Dove on 01242 515984. Do come along for a night of fun. Our November meeting will take place on Tuesday 24th November at 7.30pm at St Nicolas’ Church. Diane Lyle will teach us Hand Bell Ringing for Christmas. Please join us for this interesting occasion. Once again we shall be holding our ‘Real Christmas’ event in St Mary’s church on Saturday 5th December from 2pm. During the afternoon Christmas cards and other goods will be on sale and we shall be decorating the Christmas tree and making the Christingles for the following day’s service. Seasonal refreshments will be available. This year’s Christingle service will be at St Mary’s on Sunday 6th December at 4pm. Please see notices in church for further details. All are welcome to the Sung Eucharist at 9.30am on Sunday 6th December, when St Nicolas’ will be celebrating their Patronal Festival. Two teams from CHADS entered the Rotary Bowl on 6th October. Both young and old joined in and we were sponsored for the amount of pins we toppled. Thanks to generous sponsors we were able to raise a total of £421, half of which goes to Rotary and the other half into our bank account. This will set us up ready for our next production, when we shall again raise money for Let the Children Live! The boxes have finally been collected, the money counted and safely banked. This year we collected a record amount of £502. Thank you to all our box holders. If anyone else wants a box to collect money throughout the year, please contact me.